Two of my favorite things to do in my practice are to assess movement patterns and use kettlebells. So when I heard about the amalgamation of FMS and StrongFirst I was pretty stoked. Throw on top that Gray Cook and Brett Jones were teaching the course, and it was my most anticipated course of all time. Gray Cook has been the biggest outside influence on my career. After graduating from PT school and practicing impairment based PT, I started to notice that there was something missing. Gray Cook and the SFMA/FMS filled the void. I’ve watched almost all the DVDs, read the books, and have attended the SFMA courses. I was excited to finally catch him live in action. And he didn’t disappoint. The man is extremely entertaining, engages you with every word, somehow talks in quotes, and delivers complex and deep concepts in a country simple manner. And if you can catch him during the breaks he’d blow your mind. Plus, it’s great to see his passion for movement. He’s not trying to make money, put down other approaches, or spread a dogma; he’s just trying to help humans “move well, move often”. The surprise for me was Brett Jones. I’ve heard him in a couple podcast interviews and youtube videos, but I didn’t know what to expect in a course. I was pretty blown away with his expertise and perspective. He is an extremely knowledgeable, humble, and humorous speaker. But my favorite part about Jones was the practicality of his knowledge. Many times I feel like instructors live in the fantasy black and white world where all their patients do everything they say and get 100% better. The information and clinical pearls from Jones were extremely applicable and realistic. Listening to and talking to Jones was like talking to the smartest co-worker you’ve ever had. Together, Brett Jones and Gray Cook were outstanding. After both of them speak on a topic, there aren’t many questions left to answer. The course had 1 lecture to start on the FMS and a Gray Cook bonus lecture at the end. 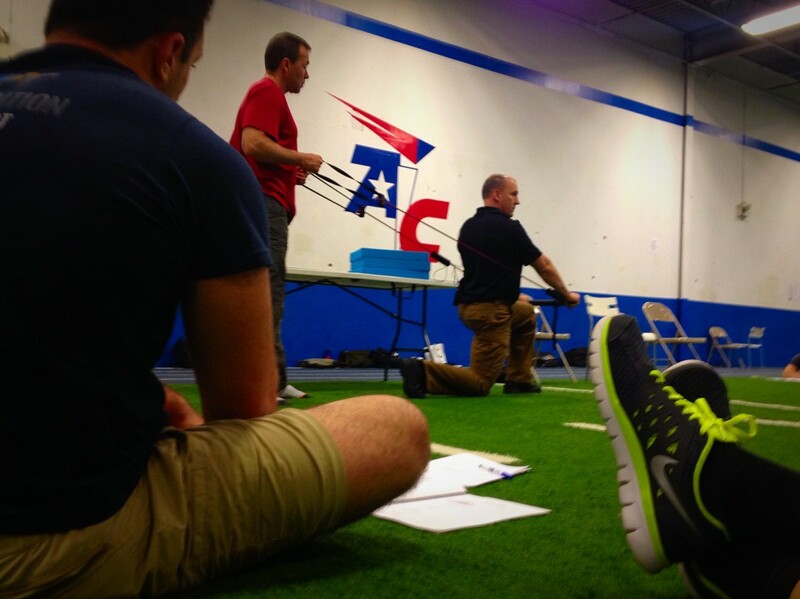 The rest of the 3 days were packed with clinical pearls on screening, interpretation, corrective strategies, technique, programming, and kettlebells. The amount I learned that can immediately go into practice is overwhelming. I cannot recommend this course enough for anyone that is interested in movement. There’s no way to possibly go over all these clinical pearls in a blog post, but I’ll try to highlight some of the great stuff I learned. 4) I need to redo all of my FMS screens; I was way too lax. 5) The set-up for the Screen is the most important. Spend time getting the proper start position and alignment. Be brutally detailed. 7) 3’s are not the goal of the FMS. Symmetrical 2’s are good enough to train without any restrictions. 8) Consider the entire screen when choosing where to start with correctives. For example, someone with 1’s on ASLR and a 1 on TSPU likely has a motor control deficit that prevents >2’s on the ASLR. 9) Mobility First. Asymmetrical mobility (ASLR & SM) is the priority since it is the area that can make the most impact on all the other functional movements. For example, if it’s a 2/3 asymmetry on the SM and there’s a 1 on the deep squat, you should address the SM. 18) Removing negatives (exacerbating behaviors, activities, exercises, etc.) is just as important as adding correctives. They advocate removing the negative activities for 2 weeks. 20) If a corrective is not changing the movement, then move on. 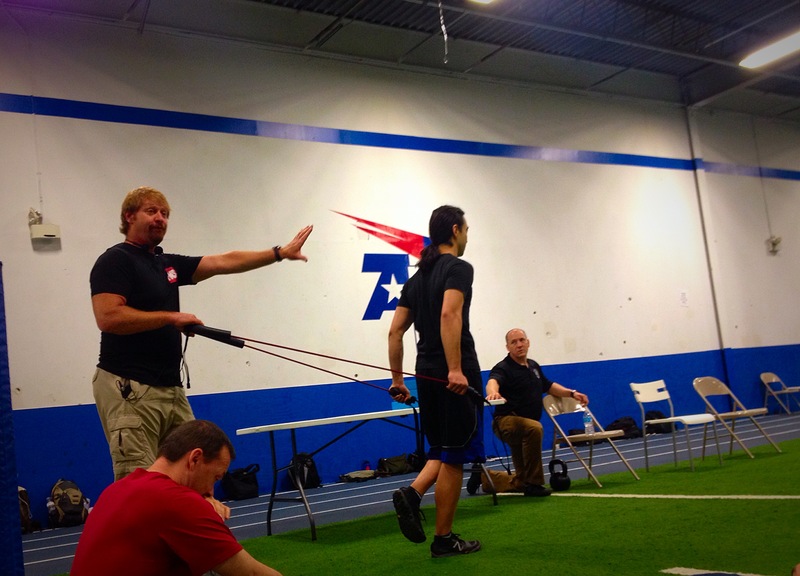 Don’t waste time on correctives that don’t lead to a positive change in movement patterns. 21) I’ve never seen anyone so violently attack their neck with a Tiger Tail like Gray Cook does. 28) Any asymmetry puts you in the “red”. In other words, if you have asymmetries there are some exercises that will harm you. 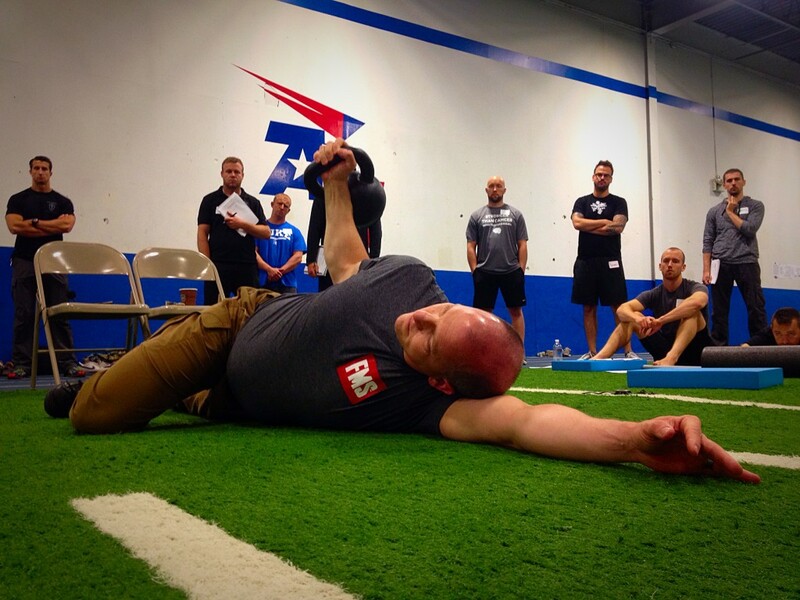 Tactile cueing for proper shoulder position during the trunk stability rotation. 33) C-Spine is the “fuse box” for the shoulders. Many shoulder problems are really c-spine problems. 37) Kneeling exercises – want prime movers off. If you lock in with prime movers, you lose reflexive stabilization. 39) Only coach lifts and techniques, don’t tell people how to move. You want people to feel movement, not hear it. 43) There are 31-32 muscles that assist in hip flexion. Don’t assume or guess. Don’t isolate one muscle. 45) Balance should be achieved with rotation, not lateral movement. This is why walking is so graceful. This was one of the best courses I’ve ever attended. Part of what made this course so great, was the required level of understanding prior to participating. Everyone in the course already knew the concepts and theory. So most of the time was spent on how to apply the right technique to the right patient and layer interventions. I’m not sure I’ve ever walked into the clinic on a Monday after a course with so many new tricks to try. As with all interventions, nothing is a better teacher than kinesthetics. Try some of these exercises on your own, then apply them to the appropriate patient. Love loaded carries for testing/training. Could you expand on #17 “Cook Drill – Overhead⇒Rack Position⇒Suitcase⇒Opposite Arm Overhead⇒Rack⇒Suitcase”? Gray Cook had us perform a great loaded carry drill during the course. He first emphasized the importance of maintaining proper alignment and only pushing it to about 80% fatigue (conversational capacity). He even set up the assistants around the room to let us know when we were losing proper position. It’s not an all out, max out, exercise. It’s more about #1 & #2. And he had 1 Rule = you must change position when you either lose alignment or reach 80% work capacity. He had us perform this for 12 minutes. Each position gets easier. It’s self-limiting. And it builds massive work capacity. During the link you provided detailing the loaded carries, it speaks about abdominal bracing. However, in your post, you talked about not pre-bracing the abdominals for every rep. So what would be consider the correct way to perform a loaded carry where there aren’t distinct repetitions? Should we just concentrate on maintaining alignment and not allowing side bending to one side and/or falling into lumbar extension? 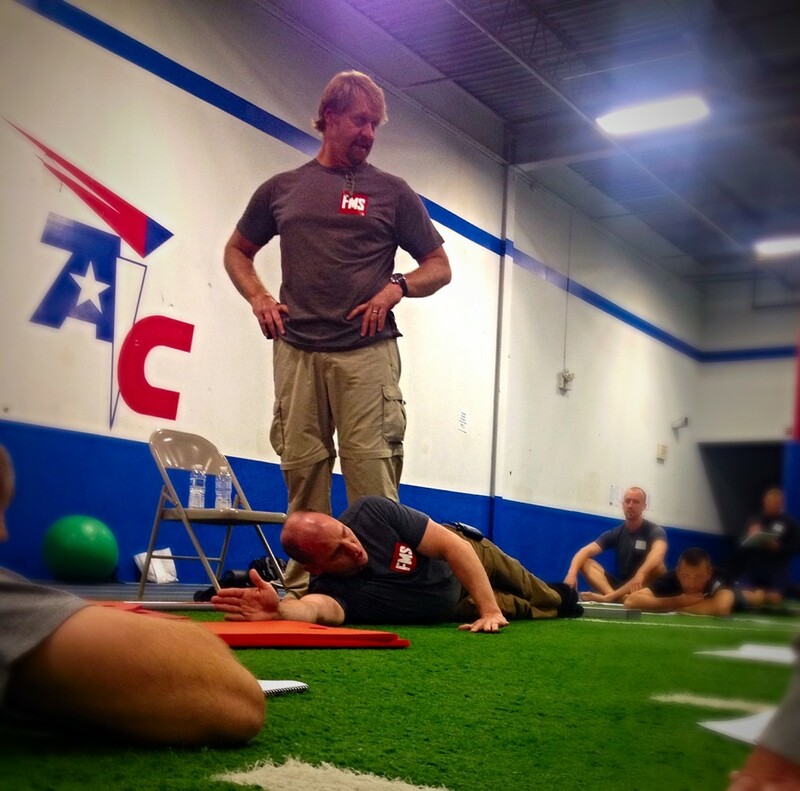 Or should be be thinking about bracing the abdominals actively throughout the entire carry? It depends on the person and situation. Both can be right. And there are always more than one way to accomplish a goal. But that’s really more of a disclaimer than anything helpful…here’s my opinion. With athletes or patients that are fairly active I rarely give the abdominal bracing cue. Like you mentioned, I have them focus on alignment, posture, breathing, and available sensory awareness (not going too high-threshold). I find most people tend to go way too fast with loaded carries and fall into lumbar extension. Slowing them down and cueing neutral spine usually gets the desired results. However, if someone has pain or a dysfunctional movement pattern, I will sometimes cue an abdominal brace. But I always re-assess during and after the movement to see if it caused any advantageous changes. Another important consideration is assessing regressed postures. 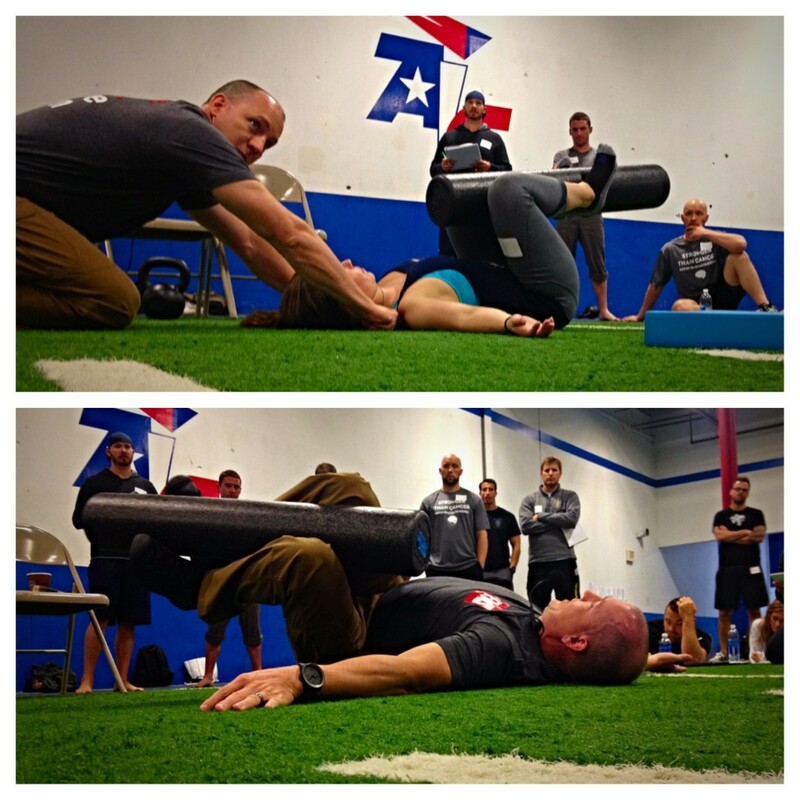 I’m a big fan of making sure people have good core control and are able to maintain proper spine positioning in various different positions (supine, quadruped, 1/2 kneeling). I also like to check and see if people can “feel” their abdominals (not contract) as they start to become proficient in these postures. If someone can’t maintain a loaded half kneeling exercise then they probably shouldn’t be doing loaded carries.